Exchange Traded Funds (ETFs) are among the fastest growing financial products today. Launched just over twenty-five years ago, they provide numerous benefits to investors. The ETF landscape is a highly dynamic and fast-moving one, constantly experiencing new developments and rising trends. Here are some of the top trends shaping the future of the ETF industry. Issuers strive to create new, valuable ETFs for investors and constantly need to innovate around the products they provide. The theme-focused ETF gives investors a vehicle to benefit from a particular investment trend. A prime example of this is the Robo-Stox Global Robotics & Automation ETF (ROBO), invested specifically in the firms that derive some of their profits from robotics and automation-related products or services. It’s easy to see the attraction of investing in a fast-growing field such as robotics, which offers potential for fast growth in a field where technology is the catalyst for rapid improvements. Theme-focused ETFs take ETF issuers further into the territory of traditional asset managers and will likely serve to attract significant new investment. We’ve all been witness to the cryptocurrency and blockchain explosion over the past few years. Though the euphoria has subsided a bit today, the motivation to capitalize on this trend continues. ETF issuers are focused on building baskets around both digital currencies and the companies that benefit from the technology upheaval they are causing. While the US markets are still working through the regulatory challenges involved in holding actual cryptocurrency in an ETF, issuers have managed to identify companies that benefit from the technology baskets around these digital currencies. A prime example is the Innovation Shares NextGen Protocol ETF (KOIN), which uses artificial intelligence to pick global stocks that have an interest in blockchain. VanEck also recently filed for a Bitcoin ETF in June – their third attempt at doing so. Shares of the VanEck SolidX Bitcoin Trust are proposed to cost $200k each. All that said, given the volatile nature of cryptocurrencies, and potentially the companies fueling the technology, it’s possible these ETFs may not represent the most attractive proposition to risk-averse investors in the near term. Many people cite the transparency of the ETF as one of its prime benefits. It follows that the proliferation of semi, or even non-transparent, baskets could be a significant shift in how ETFs are run. These would allow investment managers to “do what they do best”, whilst retaining a competitive edge by not disclosing their asset selections for competitors to see on a daily basis. The SEC views this type of vehicle with skepticism as investors would likely prefer to know precisely the assets they are exposed to. In addition, less transparency around the basket also dulls the “all day trading” benefits of ETFs – as market-makers and liquidity providers will have more difficulty hedging or arbitraging these products. So expect wider spreads and lower volume. Some investment strategies simply don’t fit with the paradigm of passive or static indexing. Certain fixed income strategies, for example, can be more suited to active management. This is one of the reasons for the growth in the number of actively managed ETFs being made available by issuers. They offer the chance to beat a benchmark and earn above-average returns for investors. Fund costs can also be lowered by cutting out or reducing holdings that are deemed to be of lower quality than other components of the basket, which would inherently not happen in a traditional index. Compared to traditional actively managed mutual funds, investors will likely benefit from lower fees and tax advantages. As of September 2018, only about 2% (or $61bn) of ETF assets are considered to be actively managed. We expect this segment to grow substantially over the next year as regulatory barriers to entry (for example the proposed removal of the SEC’s exemptive relief process) have been lowered. Who’s using ETFs? The bulk of investment comes from institutional investors who can actively benefit from massively reduced fees, enhanced liquidity and access to asset class and geographic regions which were not readily available even a decade ago. With the current shift to self-directed retirement savings, there is an ever-growing number of individuals reaping the benefits of ETFs. An often cited example is millennials opting for SRI (Socially Responsible Investing) focused ETFs. According to the Charles Schwab’s 2018 ETF Investor Study, millennials invest in ETFs more than any other demographic age segment, with 35% of those surveyed having at least one ETF in their portfolio Compare this with only 6% on average in older segments. 45% of the individuals surveyed made their investment research and decisions autonomously, without the use of an investment advisor or broker, while a quarter use technology to select their ETFs. One way of building a low-cost portfolio is employing the use of robo advisors. These offer cost advantages, tax efficiencies and take out the aspect of subjective human input in portfolio creation. The low fees and high level of competition, amongst robo advisors may make it difficult for the system to survive. At our last count earlier this year, we identified over 40 robo-advisors. The most notable recent entrants have been Vanguard and Schwab. These benefit from a natural source of funds from their existing client base and already existing infrastructure and roster of products that gives them a substantial leg up over the Betterments and Wealthfronts of the world. Similar to the theme-focused trend mentioned earlier, ETFs have become natural vehicles to express factor exposures. The ability for certain risk premia – value/growth, size, momentum, liquidity – to outperform the market has been well studied in academia and applied in practice for decades now. So the race is on to capture these risks and potential out performance in ETFs. Factor funds may offer investors the ability to outperform standard index benchmarks. The factor game is a crowded one however. By our count we see over ten US-Equity Small-Cap Value funds from various issuers. Do all these ETFs provide the same exposures? In addition to single-factor exposures, we are now getting to multi-factor products which provide a blend of different exposures. Finally, as factors are well understood in the equity space, there is still quite a bit of R&D required in fixed income. We expect to see many more innovations around fixed income factors in the near future. The cost to manage ETFs are already wafer thin, especially when compared against those of more traditional investment vehicles. Cut throat competition amongst issuers trying to undercut each other and attract new investment leads to an inevitable race to zero total expense ratios (TERs). This proves beneficial to investors, while low fees and competition can encourage regulators, legislators and the media to view the industry positively. The “core wars” that many issuers are engaging in at the moment is related to this drive to reduce costs – especially in the core building blocks of an investment or retirement portfolio. Fixed income ETFs have a strong appeal to institutional investors, particularly of small and medium sized institutions. They offer access to products they would otherwise struggle to obtain. This is particularly true for assets such as corporate high yield or emerging market debt. 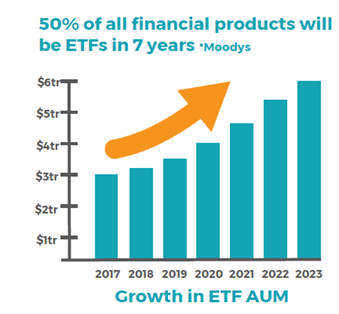 We believe the accessibility of a wide range of fixed income ETFs will act as a catalyst for growth, especially in regions such as Asia where adoption of ETFs has been relatively slower than in the US. Investors also use ETFs as a liquidity vehicle via the broker market. ETFs tend to be more liquid than their underlying bonds. If an investor wants to own the bonds outright, they may find it easier to simply purchase the ETFs and then “redeem” the ETF for the bonds. This type of trading has brought substantial transparency and increased price-discovery to fixed income. As the ETF world continues to flourish and expand, we can expect more innovation and emerging trends in the future. The ETFLogic platform will keep you abreast of these developments. 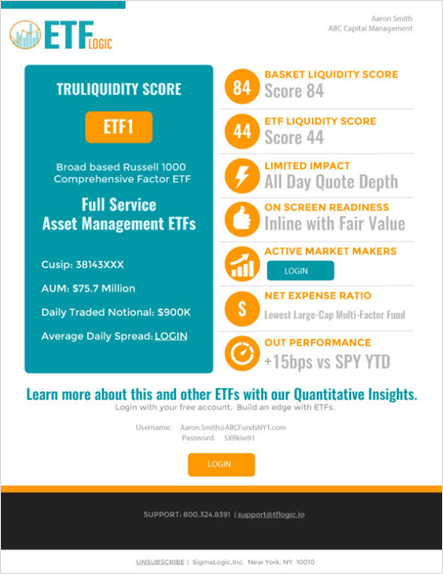 We provide robust, cutting-edge tools, analytics and data to institutional members of the ETF ecosystem, offering information from a cornucopia of sources, updated daily. The structure of the global financial system continues to be redefined by the vehicle and levels of current investment may well be just the tip of the iceberg in terms of what will occur in the coming years. Try out the ETFLogic platform, and stay one step ahead of the curve. Most newly launched ETFs face one key hurdle: Liquidity. This leads to long conversations between capital markets, sales and trading teams and the client. Having reliable third-party guidance around liquidity helps frame this conversation. The fallback option is often an Implied Liquidity measure. Implied Liquidity alone cannot convey the full liquidity picture as it relies solely on the ADV of individual basket components to extrapolate for maximum ETF liquidity. In addition, it typically assumes that you will want to trade 25% of the average share volume in the least liquid name of the basket to achieve this liquidity. This methodology faces serious issues since it fails to incorporate how trading in ETF’s actually occur. You can instantly get this answer by logging into ETFLogic. What is the cost-limiting component? What happens when you remove some components? What is the basket liquidity at the chosen impact level? We capture the impact on every basket component by incorporating market-specific costs, spreads, volatility and trade urgency – you can also download the resulting calculations instantly. Our analysis is also summarized in the TruLiquidity™ ranking that does a relative cost-comparison of a name to its peers. For example, a large-cap factor-focused fund may be more liquid than small-cap factor fund, but we will rank the small-cap fund versus vehicles that provide similar exposures in a similar fashion. The benefit: Investors get pertinent information right away on the specific asset-class exposure they seek. Ready to test this yourself? LOGIN to understand and use TruLiquidity™.